Ever have a student who works really hard but can't seem to meet deadlines? A student who is extremely smart but who can never get a long-term research paper finished because he can't get past the research stage? An adult who is sick but turns down a doctor's appointment because she doesn't have a ride that day and can't problem solve how to get one. A student who always comes to class without the required materials? Or a student who does all her homework but never turns it in? Many of our students have difficulty with executive functioning skills. They are common in students with autism as well as students with attention deficit problems. However, they are also issues for many of our other students, including those who may not have a disability. Understanding executive functioning difficulties and how to address them becomes critical for these students. It is important to recognize that executive functioning is not related to intelligence. You can have a genius IQ and have severely compromised abilities in EF. Similarly, you could have a lower IQ and have great skills and be able to function on a day-to-day basis more effectively. It's important to recognize this with many of our students. I find that once people realize how smart a student is, their expectations for that student's independence in EF are based on their intelligence. It's also important to recognize that EF difficulties are not laziness. The student isn't not doing his homework because he doesn't feel like it. Often that same student is spending hours every night spinning his wheels but not accomplishing the task. Executive functioning deficits are real and they require all of us to work together to address them and teach the student to be better able to help himself if the student is going to be successful in the long-term. Comprehensive understanding of strategies are beyond the scope of a blog post or even really a blog series. However, I recently did a parent training in a district focused on the topic and had a couple of discussions that I thought I would highlight. I also wanted to provide some resources to use to begin learning about them and strategies to teach them. 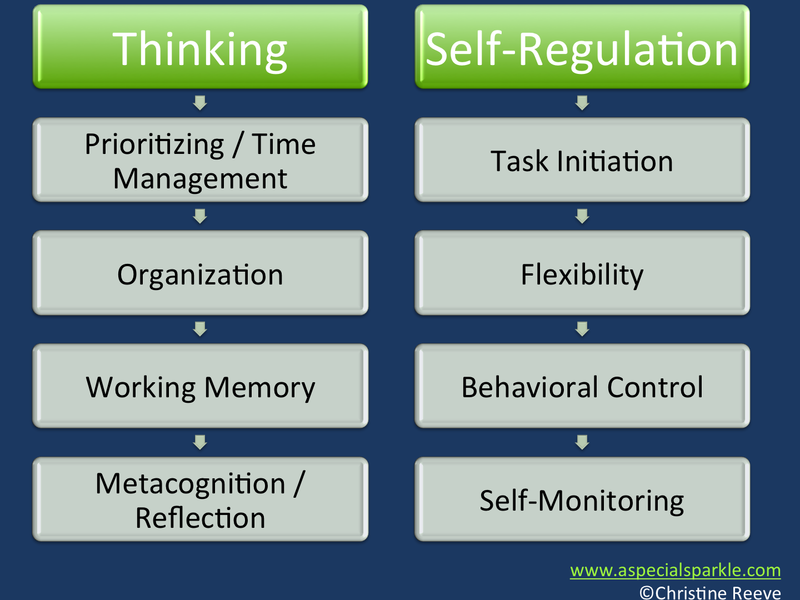 There are a few keys to addressing executive functioning skills that mean going beyond just teaching individual strategies. The focus should be on teaching students to develop, access and use strategies, not just on providing accommodations. As such, this is a process that starts young and grows over time so that as the student grows, his or her ability to function grows with it. So, where do we start? One of the first steps is to assess. We need to assess the skills the student has and doesn't have so we know what we are working with. There are several tools out there that can help with that. I've listed some books below, with Amazon Affiliate links for your convenience, below that I think are great resources with good assessment tools as well as strategies. One of the ones I really like for families is Smart But Scattered. It has assessments for parents and children and focuses on the match between the parents' skills and style and the child's so that parents can understand they child and address his and their own behaviors accordingly. 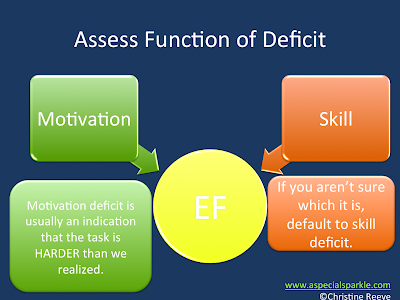 So, when we assess the student's deficits, one of the main questions we need to ask is whether it is a skill deficit or a motivation deficit. In other words, is it something that the student doesn't have the skills to manage? For instance, does he not know how to organize his locker to make sure he has the needed materials for class? That becomes a skill we need to teach. On the other hand, is it an issue where the student can tell you the strategy and has demonstrated it before, but for some reason isn't performing the skill. Then often it is a motivation issue. 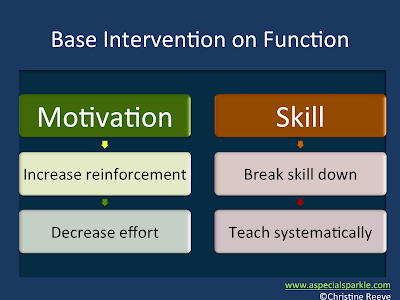 This means we have to find ways to motive the individual to use the strategies. It's important to recognize that when it is a motivation strategy, it's not laziness that prevents the strategy from being used. Often it's a red flag that the skill is harder than we think it is. Take, for instance, a student who does not shower regularly. This is a pretty common issue among my adolescents with autism for a variety of reasons. First, many of these individuals don't recognize the impact that not showering has on how others perceive them because of their social deficits. Second, many are not motivated by the same social issues of acceptance that others are so that social acceptance motivation is diminished. Finally, showers are an essentially sensory experience and many individuals find them difficult because of their difficulties with sensory issues. All of these issues feed into a motivation issue. So if the student knows how to take the shower and follow the routine, but still doesn't shower regularly, then we need to think about ways to motivate him to shower regularly with external motivators beyond just feeling fresh and clean (the reinforcer for most of us). This student isn't lazy; he isn't motivated to overcome real issues that make showering difficult and not meaningful for him. 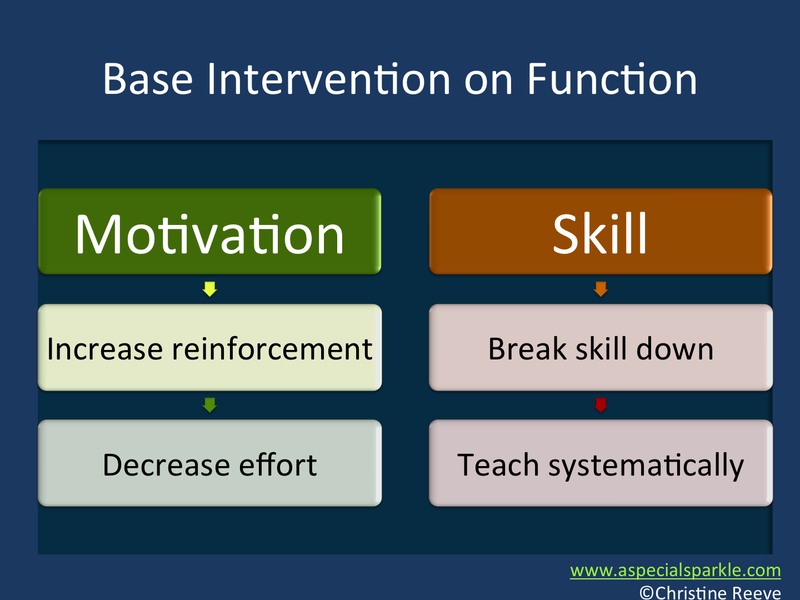 Once we can determine whether the underlying function of the behavior is motivation or skill related, we can start to develop interventions based on those functions. 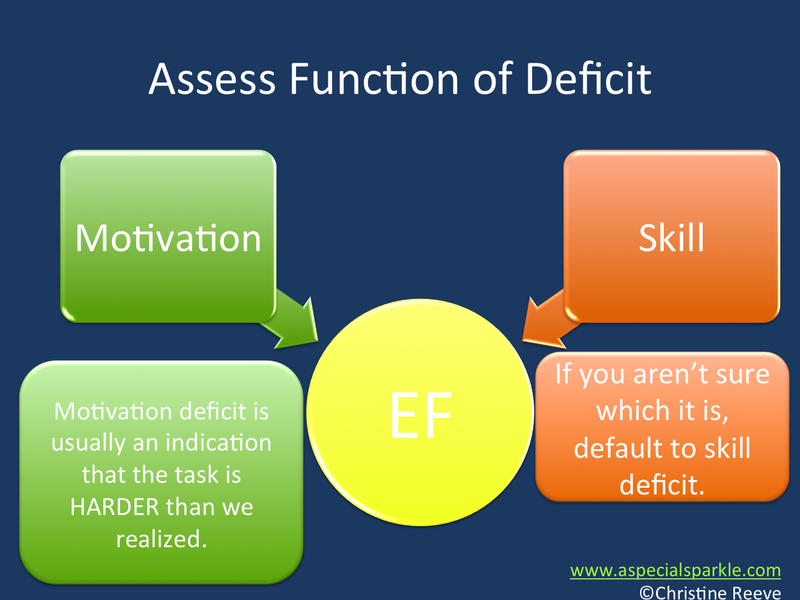 Short and sweet...if it's a motivation issue, we need to either increase reinforcement for completing the task or using the strategy OR decrease the effort involved in some way so that it doesn't take as much motivation. In the case of the teen who doesn't want to shower, we might make a contract with him that if he showers 3 days to a week (to start), he will have the opportunity to play a video game he isn't usually allowed or to buy a new video game. Find a level that the student can master, in this strategy, so he can feel successful and comes into contact with the reinforcer. If he never gets reinforced, he's not going to buy into it and it's not going to work. Consider negotiating a contract with him to see what he thinks he is capable of doing to start. Similarly if you have a student who never turns in his homework because he thinks he's done it and it's finished and doesn't understand how it factors into his grade, make a self-monitoring system that allows him to check off when his homework is turned in and have a payoff beyond the grade (since the grade doesn't seem motivating enough) for turning it in a certain percentage of the time. You could also lessen the amount of homework that he is required to do to decrease the effort, but consider having him do something toward this as he gets older (e.g., ask for the accommodation, negotiate with the teacher) to build his independence at handling this type of issue. If it's a skill deficit, then we have to break it down and teach the steps systematically. So for instance, if the student has difficulty getting a long-term assignment done because he can't organize the steps and follow through, moving to the different phases when it is time (rather than when he thinks he is ready), then that's a skill we have to teach him. So, we might have him learn (in a sequence, not all at once) to break the assignment down into composite parts (e.g., choose a topic, narrow the question, research the topic, make an outline, write a draft, write the final draft); then have him write those steps out on a calendar with the end date (due date) written in for the final step. Then we would teach him to follow that calendar and we have to motivate him to be able to follow the schedule. For instance, I had a student doing a paper on satellites. He was doing his research and knew that his calendar told him he had to stop researching and start writing an outline. However, he had put the term "satellites" into Google and felt that he had to look at every single source (which included primarily sites for satellite television) before he could move forward. Overcoming this need for completion of the research was very difficult for him and shifting between phases of the assignment was very difficult, so he needed additional motivation (opportunity to go to the mall with his friends when he was finished) to conquer it. Finally, we have to make sure that we aren't just providing accommodations alone and not building toward independence in students' abilities to master EF skills. When students are young, it is important to provide those accommodations and teach them to use them. Then we move toward independence at using them. 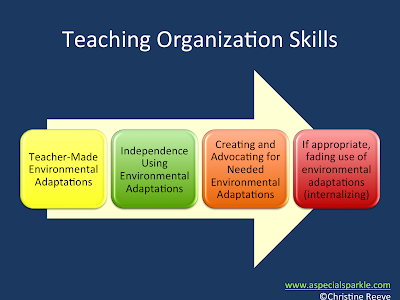 Then we need to make sure that we move to the next step of teaching the student to create strategies (e.g., a graphic organizer) on his own or to advocate for his need for environmental accommodation (e.g., learning to ask faculty for extra time on an assignment or a test). Without these skills, if this student is college bound or even work bound, he or she isn't going to have the skill to be independent at getting needs met. In college extra time is not provided unless you ask for it. Taking it away from a high school student and hoping he still passes the test is not the way to prepare him for school. Instead, we need to think about how to make him more independent at advocating for his needs and finally we need to look at how we fade out the supports, if appropriate and needed, and teach him to internalize the skill. Otherwise, we are going to have to do what a parent once said to me would be task analyzing his life until he was 80. With the strategies, he can get his own needs met and go out and be independent. The truth is we all use accommodations and strategies to help us with executive functioning. Have you ever used a post-it note? That's an EF strategy--a visual cue or writing a note to help us remember something. Taking strategies away because they won't be available in the future doesn't make sense, and yet I see lots of high school teachers do this with the justification that this accommodation won't be allowed in college. No, it probably won't be. However, if we teach the student to use a strategy on his or her own that is not accommodating the assignment or to advocate for himself with faculty members as part of his EF training, then we have taught a skill that he can take with him through life to be successful without our assistance. Executive functioning affects all of us and affects all areas of our lives. It helps to recognize out strengths and weaknesses with it and the strengths and weakness of all of our students so that we can develop strategies that are appropriate for all ages. Here are some resources that can help you to do that. 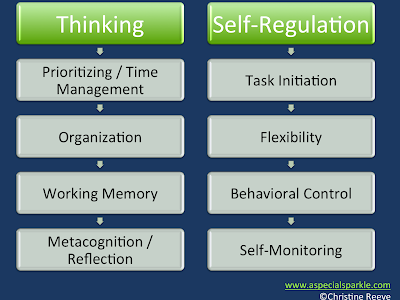 How can you address executive functioning skills in your class? Have time for reflection in the classroom or activities where students guess how long an activity will take. Use visual supports, like a schedule, for the whole class, so you aren't just providing it for students who struggle. Work with them in using a calendar to lay out the steps of assignments or due dates so they can plan when they will have time to complete the pieces of an assignment. Use commercial time management programs like Seven Habits for Highly Effective Students (Stephen Covey), Get It Done! (David Allen), or the Franklin-Covey system. In middle school begin having the students use a planner that includes activities during school and at outside of school time and estimating the time that each activity will require. These are just some of the suggestions that you can find in the resources below. Smart But Scattered is great for families. Executive Skills for Children and Adolescents is great for educators. 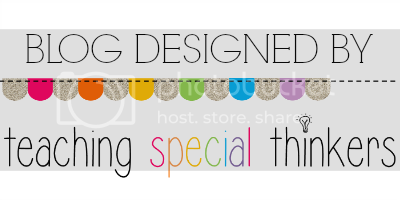 And finally, I have started a Pinterest board that has some really useful links including a number about how to work on EF with young children, as young as preschool, through the use of games and activities in the classroom. So how do you teach EF skills in your classroom? Please share in the comments. Also, let me know if this is something you would like more information about and I will do a post specifically on strategies.